Several types of jakis are commonly used by the Marshallese people for various purposes. They are used for sitting and sleeping, for protection against cool weather and rain, for protecting boats, for making several types of baskets (traditional types), for making nieded (traditional clothing) and for decoration. All mats are made from maan̄ either maan̄rar or maan̄bil. Most mats are made from maan̄ which has been pounded with a dekenin. The weaving is basically one type, although various patterns and designs can be woven into the jaki. Jakis are very important and there are many cultural restrictions and traditions observed regarding them. Jakis are very convenient and can be easily washed and dried in the sun and are continually used until very worn out. They are also easily repaired if torn or damaged. This is the common sleeping mat. It is woven from double strips of either maan̄bil or maan̄rar, depending on the color desired. Often times both types are used to weave a crisscross type of pattern. Also either jab or atat can be added for additional decoration. The width of the strips for this type of jaki is usually about one fourth inch or slightly more. A true jan̄in̄i always has a fold down the center and folds open so it consists of two halves. 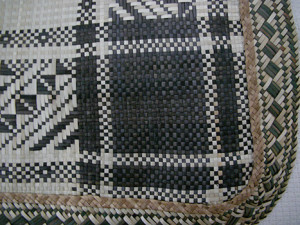 When weaving this type of mat first one half is woven, beginning at one corner of the center part where the fold will be. The desired length is determined at the beginning when a strip of weaving is begun which consists of several rows. At the completion of the first set of rows the length will be determined. From this point on further rows are added until the desired width is reached. This half is then finished by further splitting the maan̄ and weaving the border pattern. Then the other half is woven by going back to the center and placing more strips of maan̄ in between the double strips exposed from the first half and weaving across the length and adding more strips of rows until the second half is the same width as the first half. Then this half is finished with the same type of border pattern. By having the fold down the center the jan̄in̄i can be used more versatilely. If more than one person will be using the same jan̄in̄i then it can be opened up. Also, a person, especially while traveling on boats, can sleep in between the two halves and use it both as a sleeping mat and a covering as protection from the wind and rain. In the homes, usually the jan̄in̄I mats are rolled up each morning and laid aside until the night. This is a coarsely woven jaki made from either type of maan̄ that is placed under the jan̄in̄i on the floor of a house, or to cover over coral rocks in a work area. The maan̄ strips are usually from one half inch to three-fourths inch wide. It is made as one continuous jaki and its size is usually determined by the size of the room where it will be placed. Beginning at one corner several rows are woven across until the desired length is reached then new rows are added until the desired width is obtained. These jakis can be very large. When the jan̄in̄is are rolled up during the day time, the jepko is exposed and used as a sitting mat. Often this type of mat is used to protect boats. This is a new type of jaki that is used as a sleeping mat or for decoration. It is basically the same as one half of a jan̄in̄i. Often a separate border is woven from maan̄ with jab or atat added to create several types of patterns. The border is then sewn on to the mat part of the jaki. Also patterns of flowers or other designs are usually painted with dyes or woven on with yarn to the main part of the jaki. The new jejaki mats are mainly made on Namodrik and Mejit. The type from Namodrik was first created in the 1950s by a woman named Rutha. Each woman today makes her own designs with new designs being created all the time. This is the sitting mat which is still commonly found today. It is most often made from maan̄bil pinju (unpounded maan̄) and the maan̄ is left its original width. This is the only type of jaki that is basically sewn together instead of woven. The maan̄ is sewn together with an iie (large needle which is metal today but was originally from a jebar — sea animal). There are two different ways of sewing the tōlao with many variations of these two ways. The first is called wewa. In this type three or so stitches are made on each leaf when sewing the leaves together. The number of stitches per leaf may vary from one tōlao to another but with the wewa type, the leaves are never sewn together in a continuous line. 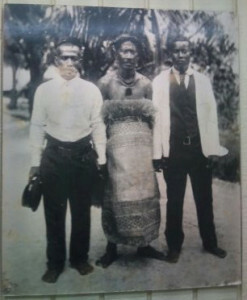 The two types of wewa tōlaos are wewa pinju, (wewa stitching with unpounded maan̄) and weamij (wewa stitching with pounded maan̄). The other common way is called wajer, where leaves that have been pounded with a dekenin are sewn together by continuous stitches. Kkwal (sennit) is used in making a tōlao. Long strips of maan̄, left their original width, are folded in half around a piece of kkwal that is as long as the tōlao will be long. As one leaf is put in place it is sewn together with a thin strip of maan̄ and this is called wewa or wajer depending on the type being made. Then another leaf is over-lapped on the original leaf and also sewn together. This process is continued until the desired length is reached. This first piece will be one half of the finished tōlao. Another half is made in the same manner. The two halves are sewn together with more maan̄, and this sewing together is called ekro. Then the loose ends of the folded over leaves, at each end of the tōlao, are sewn together with the use of more kkwal. By making two halves separately and sewing them together the tōlao can be folded down the middle for easier storing and other uses. 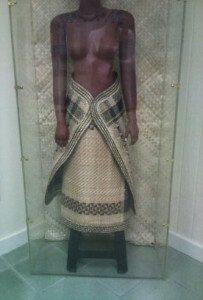 This is the traditional mat clothing of the Marshallese. It is no longer worn today and seldom are they seen, although the old women still know how to make them. The maan̄ for the nieded is pounded very thoroughly to make it as soft and pliable as possible. It is usually woven from maan̄rar. It is woven the same as half of a jan̄in̄i from an extremely fine weave. The width of the maan̄ is less than one eighth inch or three ar (lines in the maan̄) wide. Three ar wide maan̄ is called jeledrik. Usually very elaborate borders are woven separately using maan̄, jab, and atat, and then sewn on around the entire article. The very small weave makes the nieded flexible which enables it to be easily wrapped around the body. One nieded is placed at the front of the body just above the waist and tied together in the back, while another is placed at the back and overlaps the first and is tied together at the front. When these were commonly worn often a wide maan̄ woven belt was wrapped around the waist to help hold the nieded in place.